Showing 30 articles from April 22, 2015. HENDERSON -- Inclusion, according to an economic development study, isn't just about the warm, cozy feelings that equity would engender. 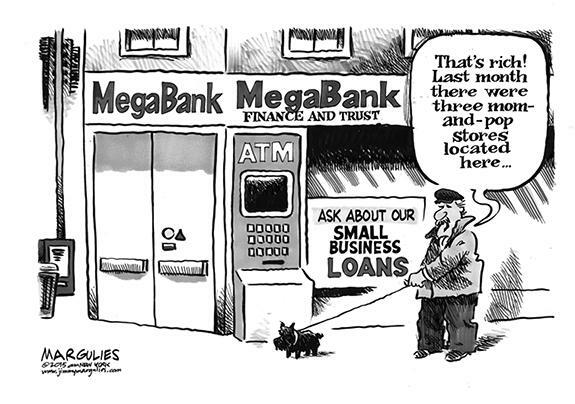 It's about cold, hard cash. A region of counties, including Franklin, could have been about $21.8 billion stronger in 2012 if there were no economic differences by race -- according to results of an Equitable Growth Profile, a two-year comprehensive study commissioned by the Kerr-Tar Regional Council of Governments, along with Triangle J Council of Governments. 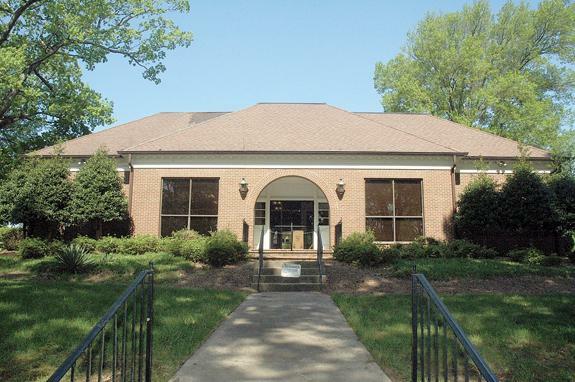 LOUISBURG -- The Franklin County Board of Commissioners agreed to buy a former bank building in Franklinton, turning it into a new base of operations for its public utilities staff. First Citizens closed the doors to its Franklinton bank last June and the 1.5 acre site has been vacant since then. On Monday night, though, county commissioners agreed to use $250,000 in public utilities enterprise funds to buy the 4,723-square foot building to house its water and sewer staff. Competitors sprint past the starting line during last Saturday's Warrior Pride 5-K Scholarship Run at Louisburg High School. The event started and finished in the LHS parking lot and featured a journey through Louisburg College and parts of Downtown Louisburg. For more on the race, see 'Sports' section. LOUISBURG -- The Louisburg town council voted unanimously Monday night to close, at least temporarily, a downtown alley despite the objections of a local businessman. The town-owned alley is on North Main Street between a building owned by Parker Lumpkin and the Lancaster Apartments building now owned by Tim Thomas. Work has begun on updating the Franklin County survey of historic properties, the first time the survey has been updated in three decades. The survey is being done by Dr. Jeroen van den Hurk, an architectural historian with the Tarboro firm of Coastal Carolina Research. 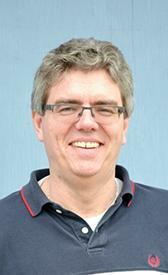 That company focuses on archeology, architectural history and preservation planning. The annual Franklin County Strawberry Festival has been scheduled for 10:30 a.m. Friday, May 8, at the Franklin County Farmers' Market in Louisburg's Shannon Village Shopping Center. The festival marks the 2015 Franklin County fresh strawberry season and the opening of the farmers' market. This year there will be a recipe competition for adults and youth including cakes/pies, breads/muffins, and novelties, all made using strawberries. Guess I should have retired after last week's edition hit the streets -- but don't get your hopes up, I'm still here pounding out the news! The old corporate axiom about "stepping off" at a high point seemed to fit after we published a large graphic with built-in headline last week. Sometimes warnings, even important warnings, come from the strangest places. That may have been the case recently when a misguided postal worker managed to sound the alarm about two issues all Americans need to be paying particular attention to -- and demanding some changes. It all began when a 61-year-old postal worker managed to brazenly fly a mini-helicopter through the no-fly zone surrounding the nation's capital and land it on the grounds of the U.S. Capital building. Coal ash problems ... what coal ash problems?!?!?!?! I've been reporting and clacking away at keys long enough to remember when a word processor was revolutionary. In other words, I've been doing this a long time. 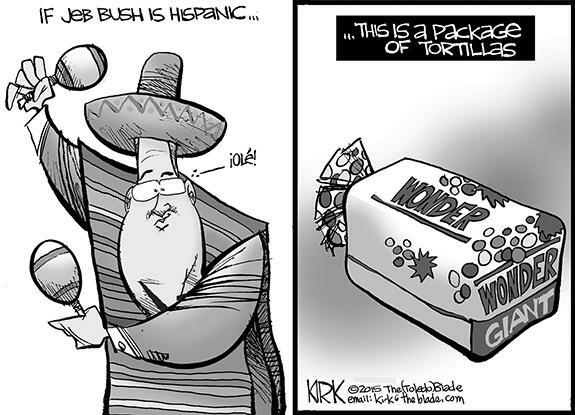 So, as jaded and old-school as this may sound, nothing much surprises me anymore. Recently I have written several articles about the negative financial impact of charter schools on true public education in Franklin County. Today I plead guilty of understating the problem and not highlighting the inevitability of a huge jump in the amount of your tax dollars that will be siphoned away from Franklin County. SPRING HOPE - Ewell Maurice Moore, 80, died Tuesday, April 21, 2015. Memorial services will be conducted at 3 p.m. Sunday, April 26, at Cypress Chapel Baptist Church with the Rev. Charles Collie officiating. SPEED SENSATIONS. 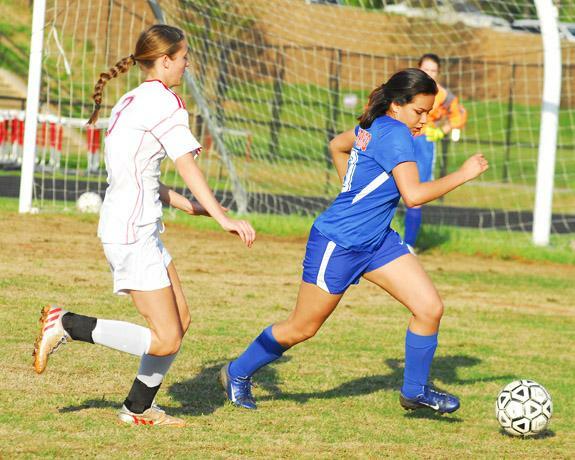 (L to R) Franklinton High School's Sydney Rednour and Louisburg's Ruby Hernandez pursue the ball during Tuesday evening's non-conference girls soccer matchup at the FHS Football Field. 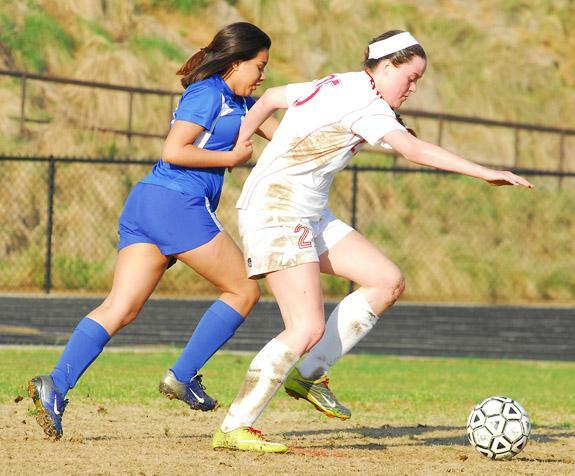 FRANKLINTON -- How versatile is Franklinton High School's girls soccer roster? 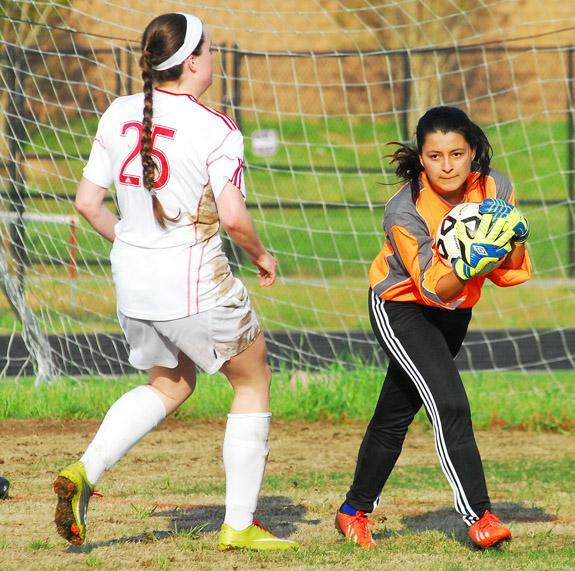 Consider that the reigning Northern Carolina Conference Defensive Player of the Year -- FHS keeper Anna Moss -- moved to forward for Tuesday's non-league meeting with the Louisburg Lady Warriors. And Moss had a huge outing along with her teammates, who controlled play throughout en route to securing a 10-0 conquest over Louisburg at the FHS Football Field. LOUISBURG -- Aside from one bad day, the Louisburg College Lady Hurricanes have displayed a penchant for being able to compete with any other opponent in the always-tough Region X fast-pitch softball standings. LC was even in the hunt for the top spot in the league before being swept two weeks ago by eventual No. 1 seed Spartanburg Methodist College at home. AND THE WINNER IS. 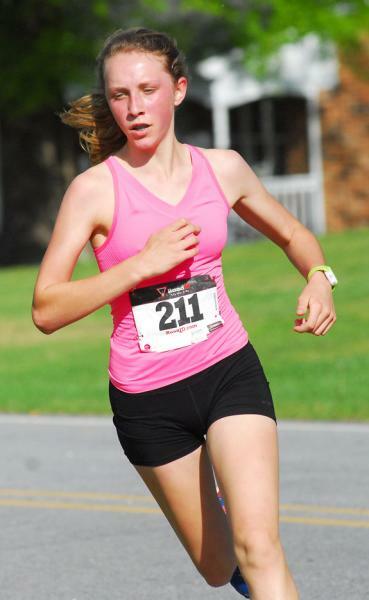 Eighth-grader Lucille Ketterer was the women's champion at the Warrior Pride 5-K Scholarship Run. 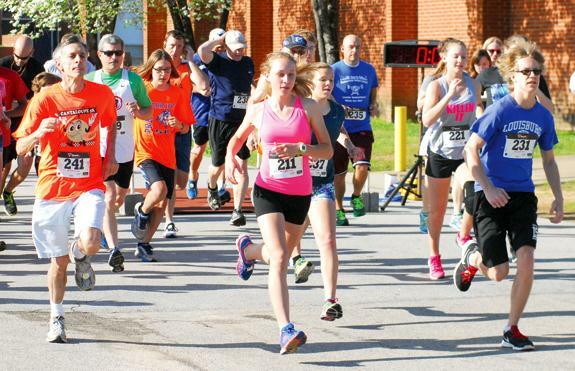 LOUISBURG -- The inaugural staging of the Warrior Pride 5-K Scholarship Run was welcomed by 93 distance-oriented souls last Saturday in the parking lot of the Louisburg High School Gymnasium. 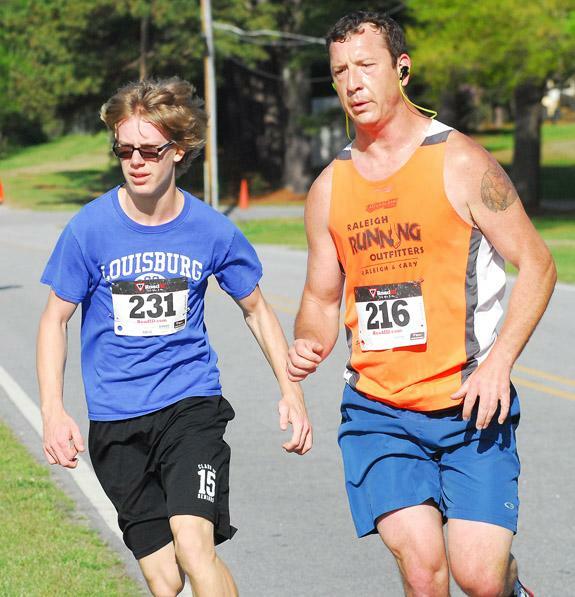 Participants ranged from experienced and hungry to first-timers hoping they could finish the hilly course, which traveled from the LHS campus down toward Louisburg College and Downtown Louisburg. BUNN -- After just one season, Peter Ashford is out as the boys basketball coach at Bunn High School. Citing the desire to spend more time with his family, Ashford recently submitted his resignation and the job opening has been posted online. Ashford, a long-time junior varsity coach at both Franklinton and Bunn, took over the Wildcats' tradition-rich varsity program after Gerald Melton stepped down last spring following a strong 15-year stretch. THOMAS OF ALL TRADES. 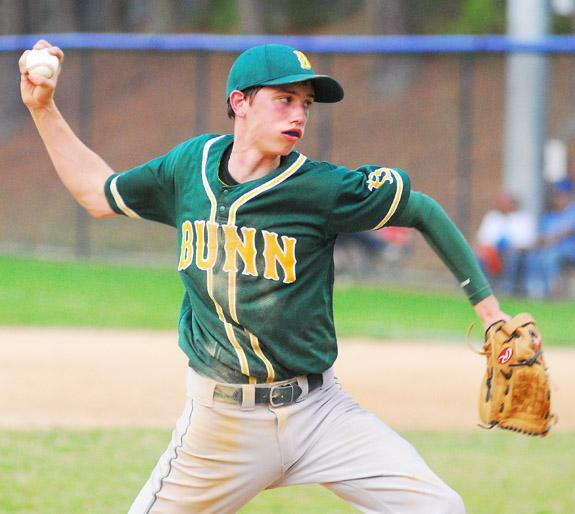 Thomas Dean has played multiple positions for the Bunn High School baseball squad -- and been successful at all of them. BUNN -- Ask just about any Bunn High School coach about his or her favorite athletic on campus, and Thomas Dean's name will inevitably be mentioned. Even if that coach isn't involved with the sport that Dean plays. That's the kind of impact Dean's team-oriented approach has made during his successful four-year career at BHS. 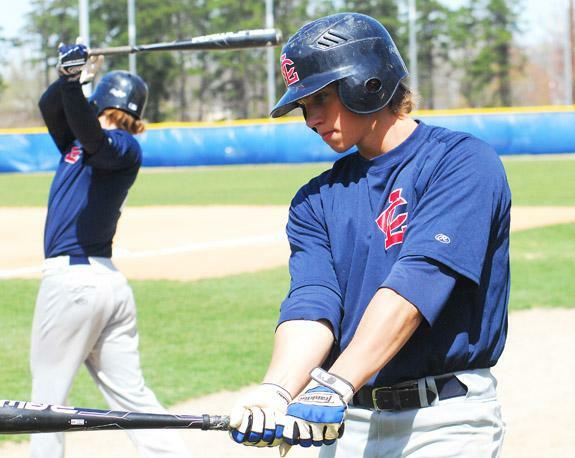 LOUISBURG -- Even with the recent bad weather, the Louisburg High School baseball squad has been able to make a move in the Tar-Roanoke Athletic Conference standings. With first place on the line in the TRAC, the Warriors were able to beat Granville Central -- and the rain -- during last Tuesday's key matchup in Stem. FRANKLINTON -- Tiara Wilkins has had a change of heart, and that will mean a faraway change in address for the Franklinton High School volleyball standout. 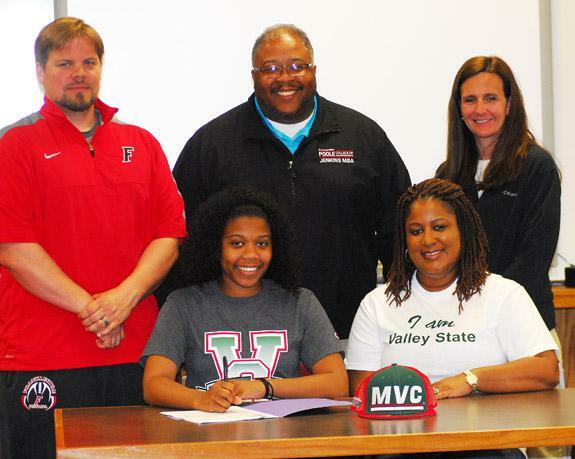 Wilkins, a three-year starter at FHS, signed with Greensboro College last fall and was intent on going to school there -- until her club coach (Douglas Hunter) took over the program at Mississippi Valley State University. WINSTON-SALEM -- Yean Carlos Gil allowed four earned runs and five total over five innings and suffered his third straight loss as the host Winston-Salem Dash defeated the Carolina Mudcats 5-1 at BB&T Ballpark on Tuesday night. The Dash victory evened the series at 1-1, the finale was scheduled for Wednesday morning. Gil (0-3, 3.94) allowed two runs in the first, one in the second and two more in the fourth. 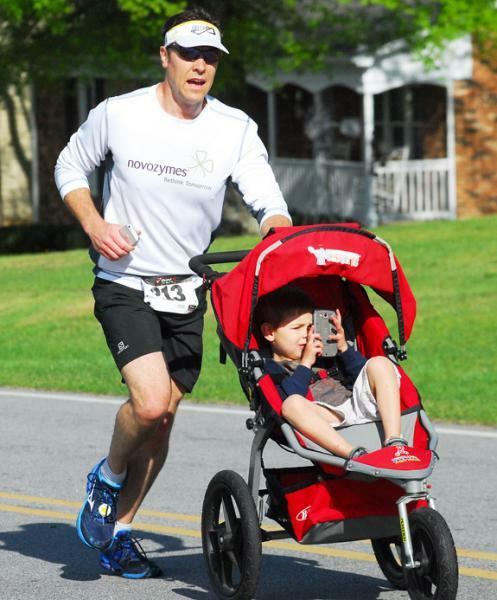 Nathan Kreel does the heavy work as his son checks out dad's cell phone. (L to R) Zachary Johnson and Mike Lowry sprint toward the finish line at the Warrior Pride 5-K Scholarship Run, which was staged last Saturday. Louisburg High School's Leslie Mata-Ruiz (right) comes up with a save as Franklinton's Anna Moss looks for a rebound during Tuesday's non-conference girls soccer contest at FHS. 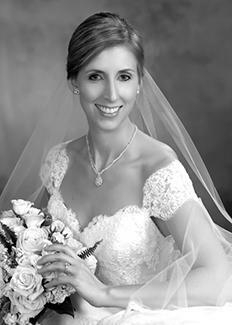 Sarah Thomas Walston and Randall Hayden Hathaway Madry Jr. of Raleigh were united in marriage Saturday, April 18, 2015 at five-thirty in the afternoon at First United Methodist Church in Wilson. The Reverend David Bennett Williams, brother-in-law of the bride, officiated. RALEIGH -- A Raleigh man is slated to appear in court next month on charges that he killed a woman with Youngsville ties. Authorities responded April 18 to an area behind Triangle Town Center mall to find Kimberly Richardson, 25, suffering from a gunshot wound. 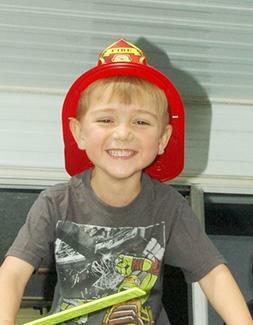 Richardson, who was raised in Youngsville, but lived in Raleigh, died the following day. FRANKLINTON -- Town commissioners approved plans for a building project that developers say could transform downtown. And it won't cost the town any money. Back in January, town commissioners agreed to support S.L. Nusbaum Realty's plans to turn the old Sterling Cotton Mill Building, into a mixture of business, affordable housing and small business development.